Robi's "Magic Carpet"-Our SMB Sprinter Build post inspired us to document our own. We’ve enjoyed your story about your camper van history. It brought back many memories of our own camper van and camping vehicle past which lead us to Sportsmobile. In 2015 we bought our first brand new Sportsmobile, a MB Sprinter 144” high top from SMB West. Before I get too far ahead of myself, I’ll rewind forty plus years where the story begins. In the late 1960’s while in college, I worked as a lot boy at a VW dealer where one day I was assigned the job of unpacking and setting up a brand new Westphalia camper in the showroom. It had every available accessory including the side tent. That was it, I was hooked! I knew I had to have a camper van someday and the sooner the better. I saved what I could of my summer earnings through college and shortly after graduation, my wife and I as newlyweds bought our first VW bus. It was no Westphalia, it was a 1965 Kombi with nothing inside but the two front seats, a rear bench seat, and gray painted metal. A lot like a tin can inside. It was under powered and loud but it was ours. With a limited budget and a thimble full of knowhow, we turned that VW bus into a cozy camper in the parking space of our apartment. We enjoyed lots of wonderful adventures in it over the next few years. Sorry, we couldn’t come up with any photos of that one but it was of the vintage of the one in the SMB West showroom. By the mid-seventies, our income had increased a bit and we were living in a house with a garage. While the price of a VW Westphalia remained beyond our means, we now had a little more experience, a few more resources to work with, and a modest amount of enclosed workshop space available to dive into building our second VW camper. We purchased another VW Kombi, a 1968 which was the first year of the newer body style. We incorporated what worked from our first build along with a few new features like a sink and small storage cabinets and of course a tape player in the glove box and speakers in the rear. That build really turned out nice. We traveled up and down the west coast and back and forth across the U.S. in it. Along the way we added a gently used genuine Westphalia side tent to it which only added to its awesomeness. We had that camper bus for several years and a few engine rebuilds. By the last engine rebuild, we’d squeezed every ounce of performance out of that engine. 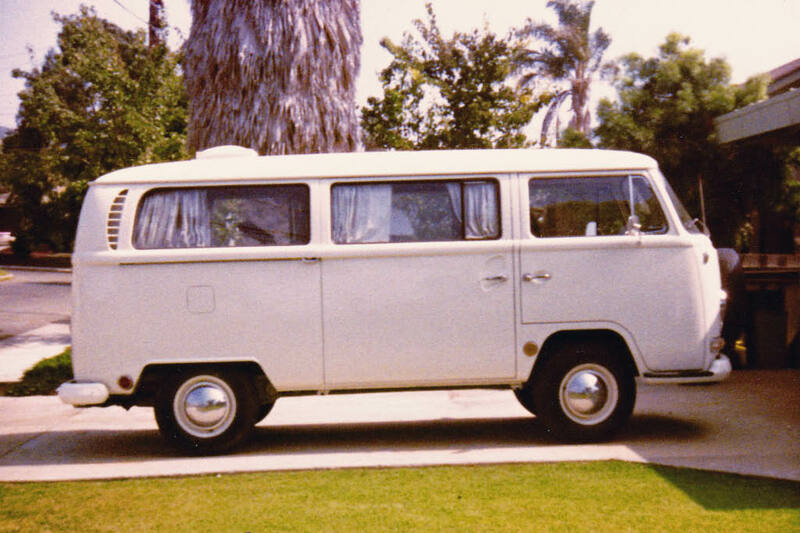 By the mid-eighties our family had grown to the point where the 1968 VW bus just wasn’t cutting it anymore. Camping had become a chore! There was too much stuff and packing and unpacking was taking the fun and spontaneity out of our camping adventures. 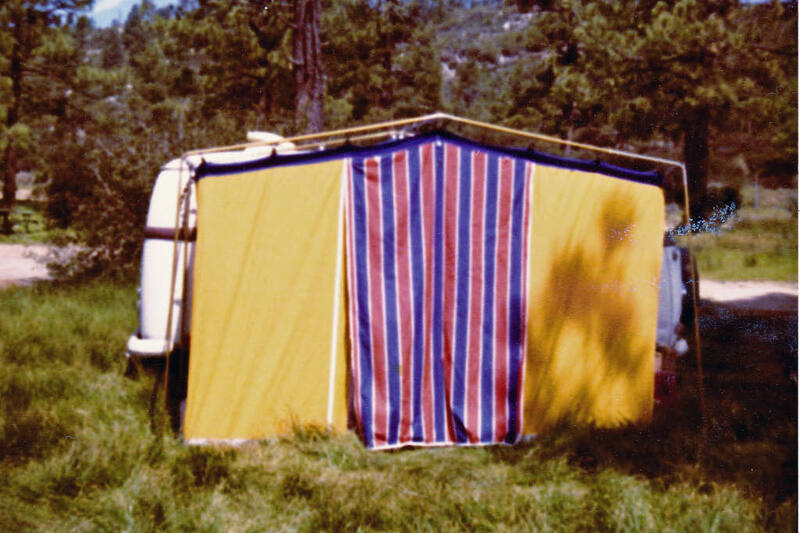 This is when we sold the VW bus and bought a secondhand Colman tent trailer. This seemed like a reasonable and affordable solution for a family of four. It provided far more interior space than the bus and we could store most of the camping gear in the trailer so it would be pretty much ready to roll at a moment’s notice. Setup and takedown was relatively simple so the amount of time and effort schlepping stuff in and out of the bus was significantly reduced. We had a lot of fun with that trailer over the years. Fast forward to the mid-nineties. Our children were teenagers doing well in high school and heading for college. The fun-time tent trailer had been parked under its cover on our patio without an adventure for too long so it was time to find a new family to enjoy it. So with heavy hearts and a tear in our eye, we waved goodbye to it as it rolled off hitched to a nice young family’s minivan to experience lots of new adventures. So, with the kids off to college, we turned to ocean cruising for several years. After being treated like royalty while cruising, we came to miss van camping, go figure! This was a style of travel we both really enjoyed and recognized was in our blood. We love van camping! We like having our shell on our back. It’s the ultimate way to travel for us. Although cruising is a close second, we learned you can always do both. So, cruising to Australia and New Zealand might be great, but once we were there, shifting gears to renting a camper van seems like the ultimate fun adventure to us. Back to the SMB story! In early 2010 when we had a grandchild due to arrive in May. With two working parents, we thought we could help them by being available to care for the baby as needed. We live a couple hours away and they had a relatively small house where we’d have to sleep on the couch which didn’t seem like a great option to either of us. We immediately thought about getting a camper van to park in the driveway to use as our retreat. We’d already been researching Sportsmobile for a few years and even visited SMB West a couple of times in our travels. Remember, the seed that was planted back when I was a lot boy was planted deep! So, in 2010, we bought our first Sportsmobile! It wasn’t new, but it was very clean with low mileage. We decided to move ahead with this purchase so we could have our space to hang while caring for our granddaughter a couple hours away from our home. 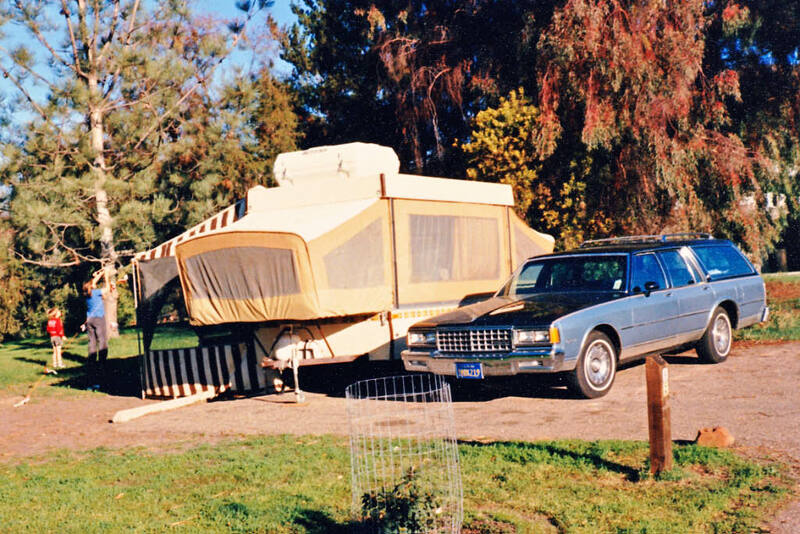 Around this time we visited the SMB West facility a few times but resisted ordering a new one because we’d been away from the van camper world for several years, were much older, and concerned this might just be a romantic notion. As you all know, ordering a new one is a substantial commitment in terms of planning, time and dollars. We bought a 2006 regular body Ford 5.4 gas V8 Indiana build with a penthouse top with 19,000 miles on it. It was a walkthrough floorplan with a manual penthouse, pull-out gaucho side couch, standard refrigerator, 2,000 watt modified sign inverter, dual group 27 batteries, and a microwave oven. In addition, it had a sink, electric water heater, TV DVD player, Starcool AC, and several cabinets and drawers. No propane stove or heater. It was comfortable and reliable for the 16,000 miles and five years we owned it. We added an awning and several little modifications like insect screens, a portable inside shower, and custom hold-down straps for our gear. This van was reliable and comfortable with its AC and V8 power. We averaged nearly 15 miles per gallon over our travels. Oh, it also filled the bill as our retreat pod while caring for our first grandchild. 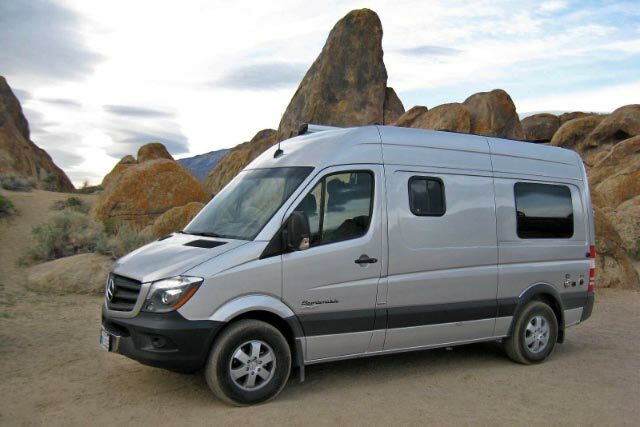 Since about 2008, we’d been keeping our eye on the MB Sprinter chassis. We thought this might be our next move. Since we found the Ford SMB penthouse to be fun and not just a romantic notion, we were back in the game. We still really liked traveling in a camper van! Along the way, we both retired from 40 plus years of working and continued to follow Sportsmobile. We were seriously talking about ordering a high-top 144” Sprinter because while we liked the penthouse top, we’d had enough time to enjoy it and were beginning to feel the conflict between age and climbing up and down during the night when nature called. We both agreed a high-top sprinter where we could stand up all the time with a lower bed would be appropriate for us moving forward. 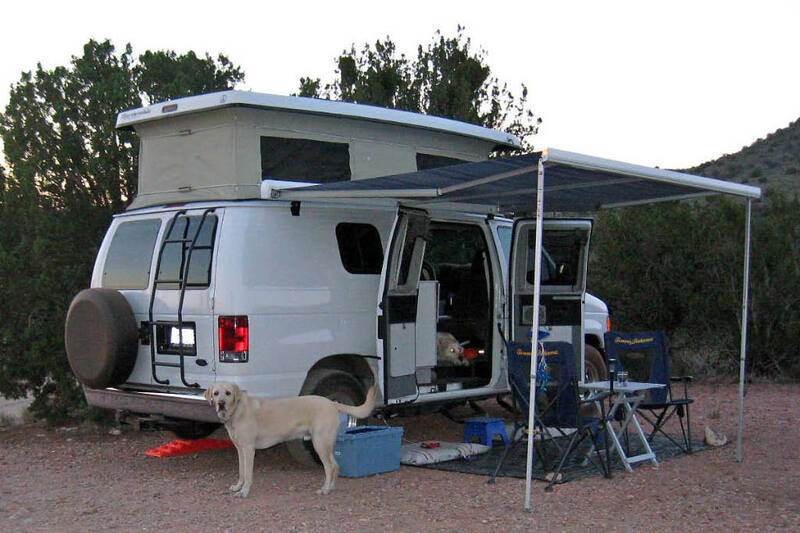 The high-top would also be quieter and more comfortable in high winds when camping. At the end of 2014 while perusing the SMB West new stock webpage, I saw a 144” high-top Sprinter built for the October 2014 Pomona California RV show that was still in stock. It had lots going for it as far as we were concerned. Exterior and interior color as well as floorplan were attractive to us so we made an appointment to head to Fresno to look at it. The rest is history! We bought it! It wasn’t the interior paneling color or floorplan we were originally thinking we wanted should we have ordered it. It was better! We both felt fortunate to have had an opportunity to step into this completed Sportsmobile before ordering a custom build. SMB West calls our floorplan a modified 151S. Even though it has a shower porta-potti compartment and lots of upper storage, it has a very open feeling. It is brilliant silver with a maple and gray interior with a black counter top and hardware. This one doesn’t have propane either. There isn’t a built-in stove which is fine since we prefer to cook outside on our Colman stove. If the weather is bad, it has a small portable butane stove we can use inside. Heat and hot water are provided by the Espar D5 Hydronic furnace/water heater which runs on diesel from the main fuel tank. So far everything has worked great! We’re especially pleased by how well the 200 watts of solar works. It seems to adequately cover all our electrical needs.